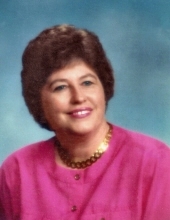 Peggy Jean Housewright, went to be with the Lord on Tuesday February 5th, 2019; surrounded by her two loving sons and daughter in law. She was born August 15, 1942 in Collinsville, Texas to Homer & Opal Todd. Peggy was a longtime resident of Howe, Texas where she raised her two sons and was a member of the First Baptist Church located in Howe. Peggy worked in banking her whole career and met so many people who would call her a friend. She made a habit of putting others before herself and was always there to lend a helping hand to anyone in need. She will be sorely missed by all her friends and family. Peggy leaves behind her son Terry Housewright, daughter in law Joanna Housewright, granddaughter Grace and grandson Trenton. Her son Keith Housewright, daughter in law Jill Housewright, granddaughter Courtney Orloff, grandsons Aston & Nick Hayes and great grandson Jude Hayes. She also leaves behind many family and friends who will all miss her dearly. Services for Peggy, will be held at 10:30AM Saturday, February 9, 2019 at the First Baptist Church of Howe, burial will follow at Hall Cemetery, in Howe. The family will receive friends from 6:00PM to 8:00PM at Scoggins Funeral Home, Friday, February 8, 2019. To send flowers or a remembrance gift to the family of Peggy Jean Housewright, please visit our Tribute Store. "Email Address" would like to share the life celebration of Peggy Jean Housewright. Click on the "link" to go to share a favorite memory or leave a condolence message for the family.